Continuing the theme from earlier this week, here is another photo of a sunflower seed head. 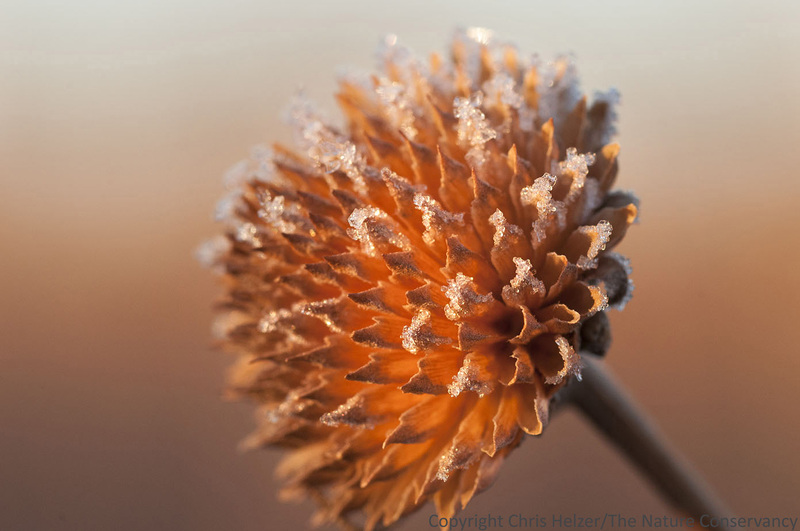 This one was taken on a frosty morning last week. A Maximilian sunflower seed head. Deep Well Wildlife Management Area, Nebraska. I usually try to avoid putting a horizon line behind the subject of a close-up photo because it can add unnecessary distraction to the image. In this case, however, I tried the photo both ways and decided I liked the one with the horizon better because it gave the image some additional context and depth. Here’s the alternate version – see what you think. The same sunflower head shown above, but from a slightly different angle to keep the horizon line out of the image. 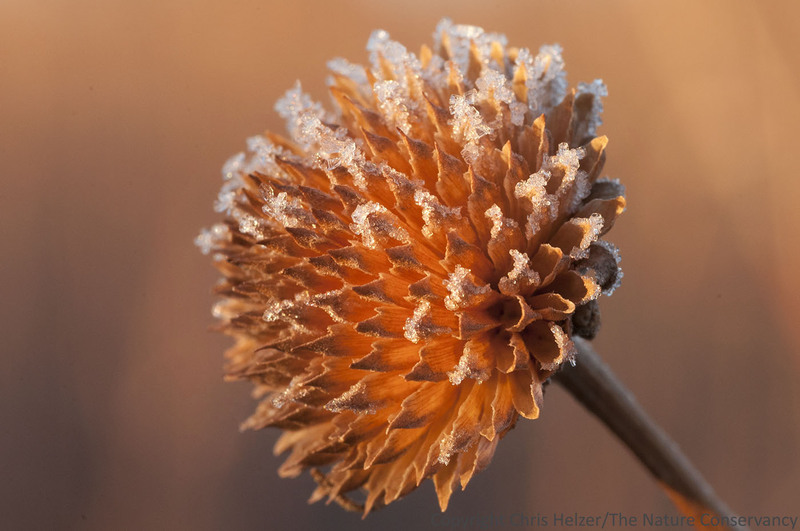 This entry was posted in Prairie Natural History, Prairie Photography, Prairie Plants and tagged composition, horizon line, macro photography, nature photo, photo, photography, seed, seed head, sunflower, winter by Chris Helzer. Bookmark the permalink. I like it better with the horizon. Not only because the color shift adds some depth, as you mentioned, but also because the blue sky calls to mind the sun itself, which is pretty poignant for an image of a snow-laden sunflower. I like the horizon – gives it context. Of course, both are great photos (as usual)! Chris, what type of camera do you use? You have posted some great photos. I am looking at getting into wildlife photography. I know it is an expensive hobby, but it gives me yet another excuse to get outside! Hi Andrew, I’m using a Nikon D300s right now, and a 105mm macro lens for close up work. If you click on the “Photos” tab on the home page of the blog (under the title and picture at the top of the page) you can see more information on my photo equipment etc. I’d encourage you to get into photography, of course. My advice is to buy a cheap digital SLR camera and spend your money on good lenses rather than an expensive camera body. Have fun! I’m just starting to get into nature photography myself, and I’ll make a suggestion that I’m finding useful. This isn’t always possible, but it often is. If you download a picture from a website like this, you can see quite a bit of info about how it was taken. You usually need to click on the image to open the full-size version, and then you can right-click that image and choose Save Image As… . Once you’ve saved it, you can right-click on the file you saved, and choose Properties, then click on the Details tab. It will show you what camera model they used, as well as the focal (zoom) length, F-stop, all that kind of stuff. As I try to teach myself those settings, it’s interesting to see what other people are doing to get the results they get. Hope I didn’t get too techie there with the instructions. Those are for Windows, btw, but you can do roughly the same thing with a Mac. I liked the second one best without the horizon. Don’t know why, just don’t like straight lines i guess.But both pictures are beautiful. Thanks for posting. There is a line? I just see a gradation. Perhaps the first looks better with it. I like the horizon line image better also. The other one seems to have some vertical blotches in the lower left I find distracting. Nice shots as always. I like both. I had to go back and forth a couple times to see the difference.